The invention provides compositions containing a retinoid and a lincosamide antibiotic for the treatment or amelioration of rosacea. The invention also provides methods for treating or ameliorating rosacea using compositions containing a retinoid and a lincosamide antibiotic. 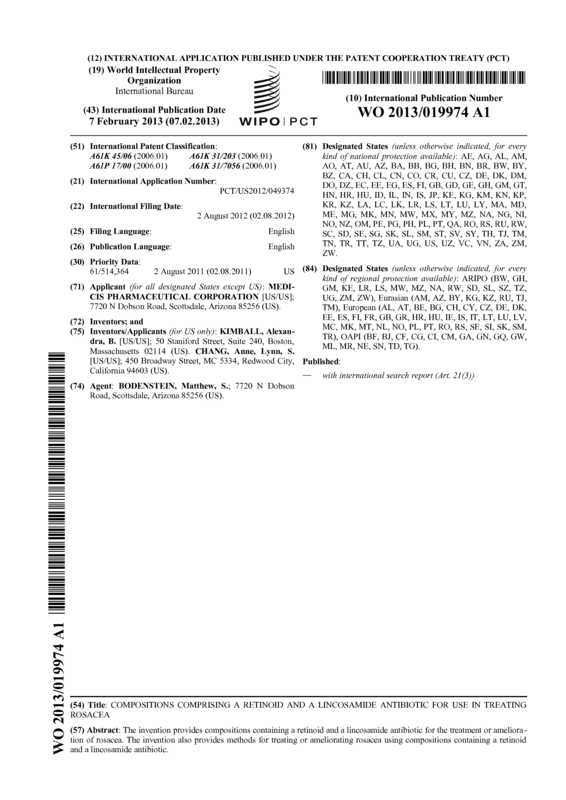 A method for treating or ameliorating the topical symptoms associated with rosacea comprising topically administering to a patient in need thereof a therapeutically effective amount of a composition comprising a retinoid and a lincosamide antibiotic. 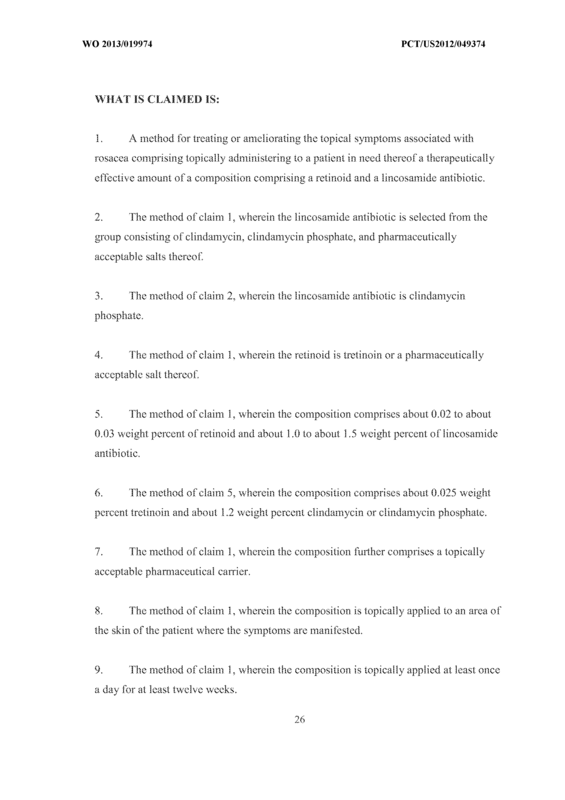 The method of claim 1 , wherein the lincosamide antibiotic is selected from the group consisting of clindamycin, clindamycin phosphate, and pharmaceutically acceptable salts thereof. 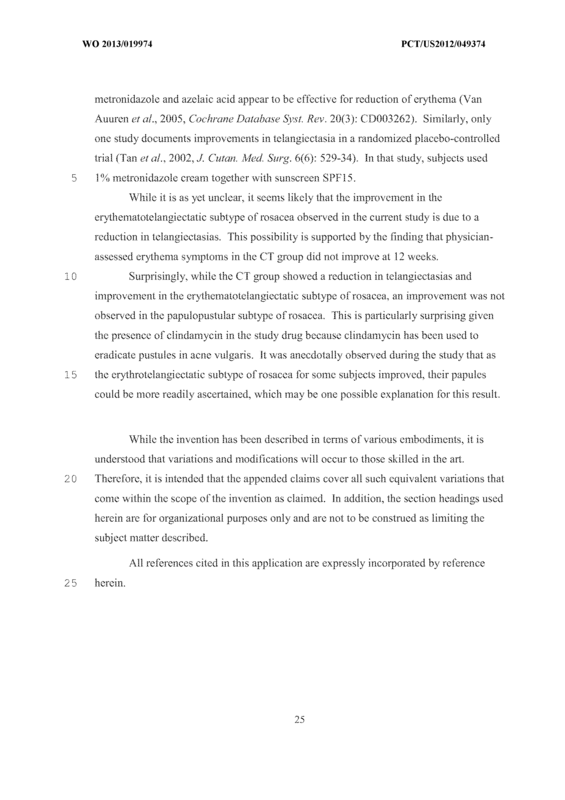 The method of claim 1, wherein the retinoid is tretinoin or a pharmaceutically acceptable salt thereof. 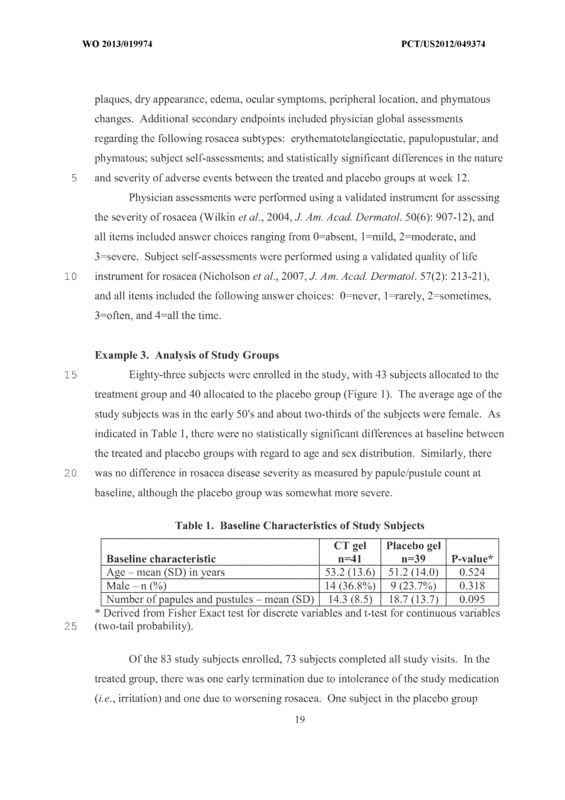 The method of claim 1, wherein the composition comprises about 0.02 to about 0.03 weight percent of retinoid and about 1.0 to about 1 .5 weight percent of lincosamide antibiotic. 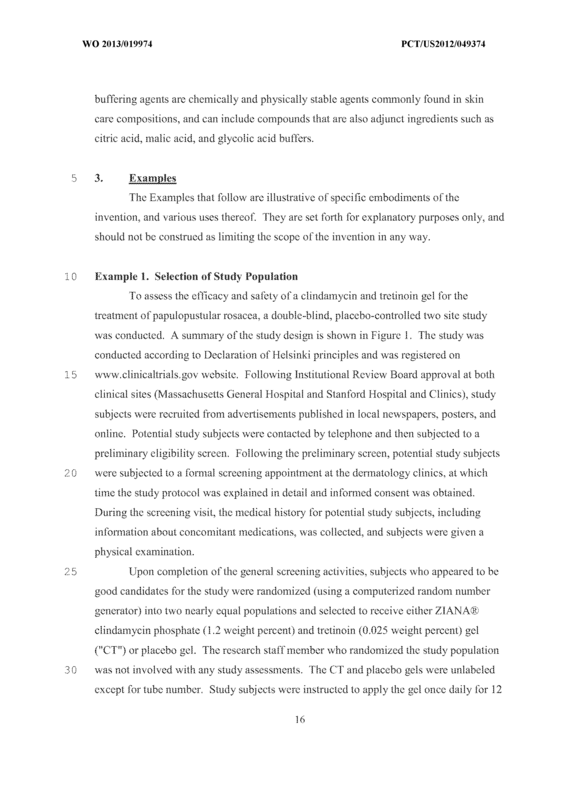 The method of claim 5, wherein the composition comprises about 0.025 weight percent tretinoin and about 1.2 weight percent clindamycin or clindamycin phosphate. The method of cl aim 1, wherein the composition is topically applied to a area of the skin of the patient where the symptoms are manifested. 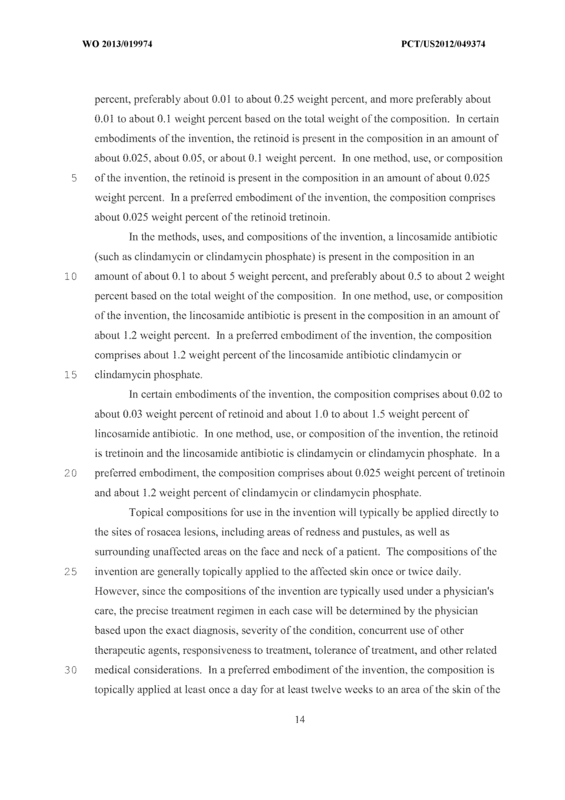 The method of claim 1 , wherein the composition is topically applied at least once a day for at least twelve weeks. 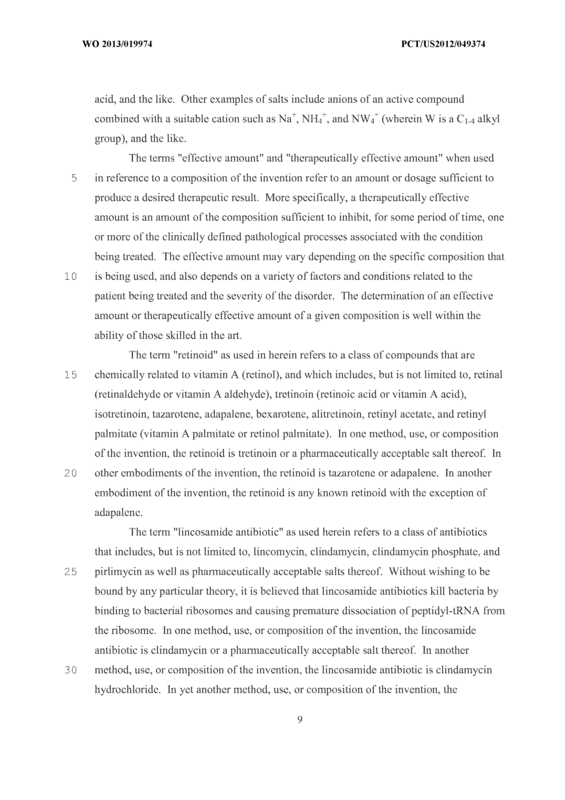 The method of claim 1 , wherein the rosacea is the erythematotelangiectatic subtype. 1 1 . 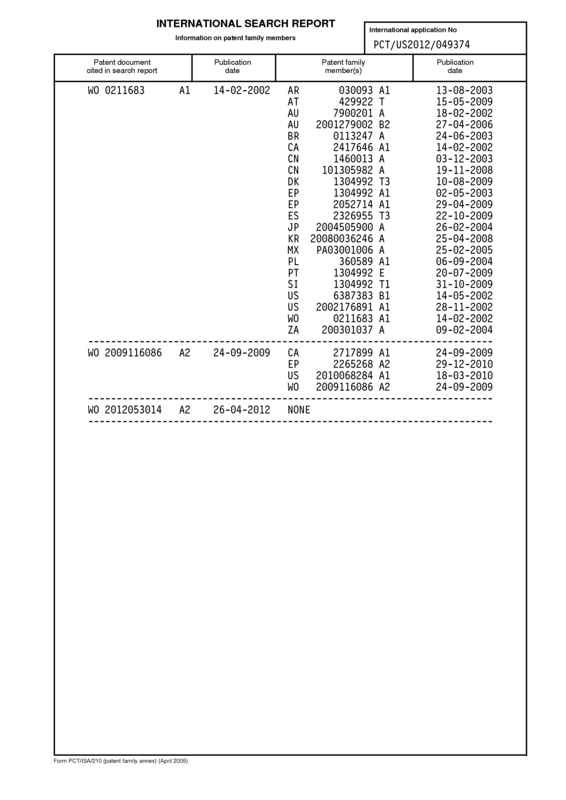 The method of claim 1, wherem the treatment results in a reduction in erythema. 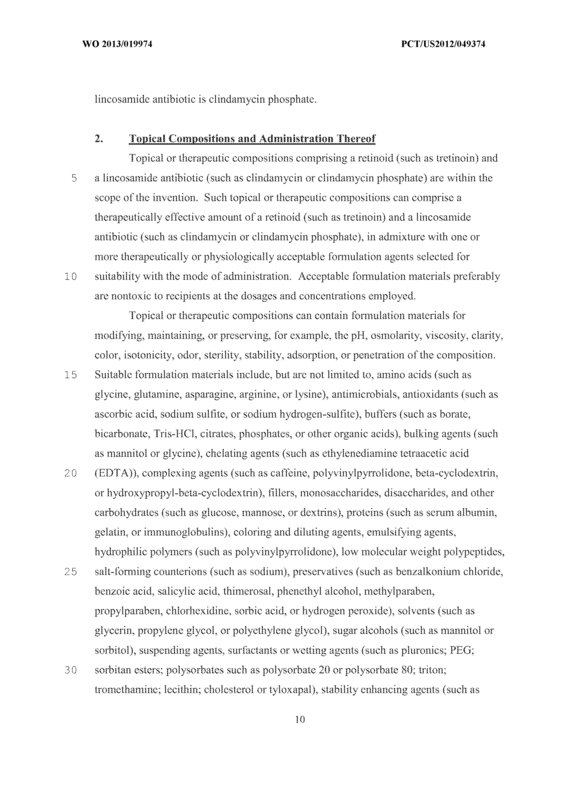 The method of claim 1, wherein the composition is in the form of a gel, liquid suspension, emulsion cream, ointment, or powder. 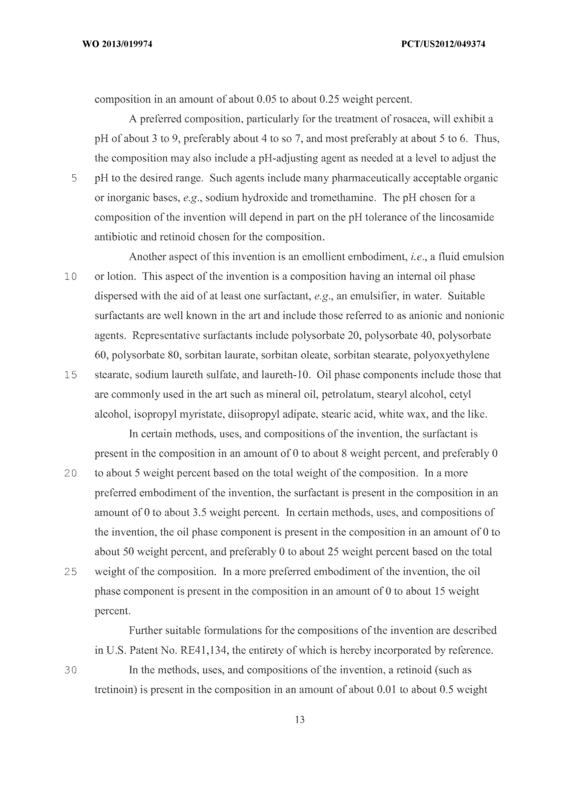 wherein the composition has a pH of about 3 to about 9 and a viscosity of l ess than about 15,000 cP. 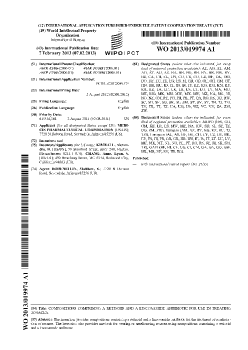 The use of a composition comprising a retinoid and a lincosamide antibiotic for the manufacture of a medicament for treating or ameliorating rosacea. 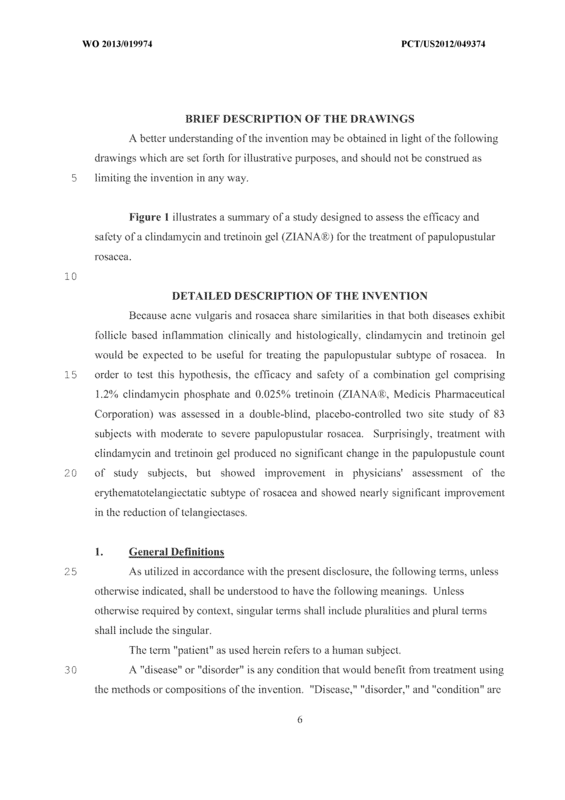 The use of claim 15, wherein the lincosamide antibiotic is selected from the group consisting of clindamycin, clindamycin phosphate, and pharmaceutically acceptable salts thereof. 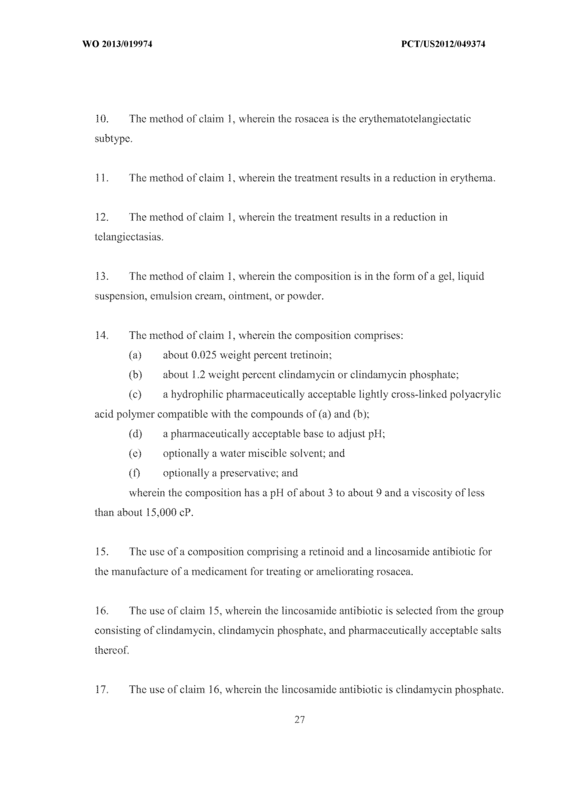 The use of claim 16, wherein die lincosamide antibiotic is clindamycin phosphate. 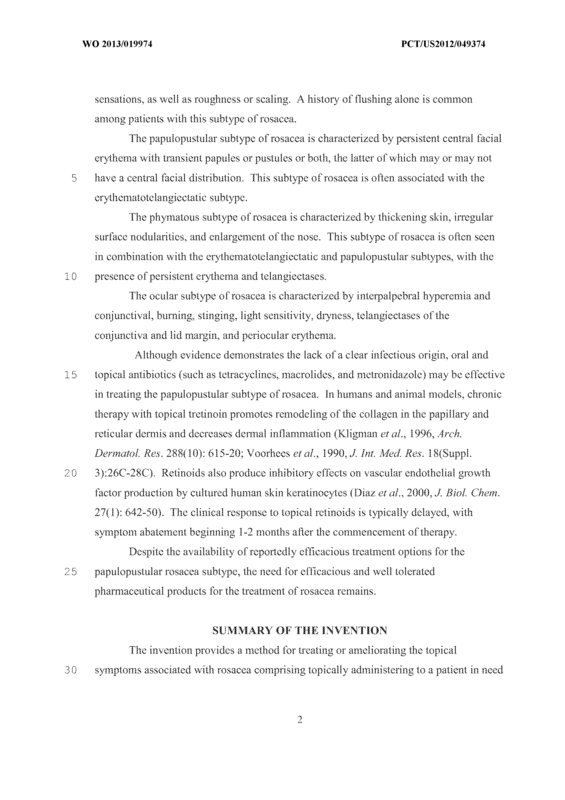 The use of claim 15, wherein the retinoid is tretinoin or a pharmaceutically acceptable salt thereof. 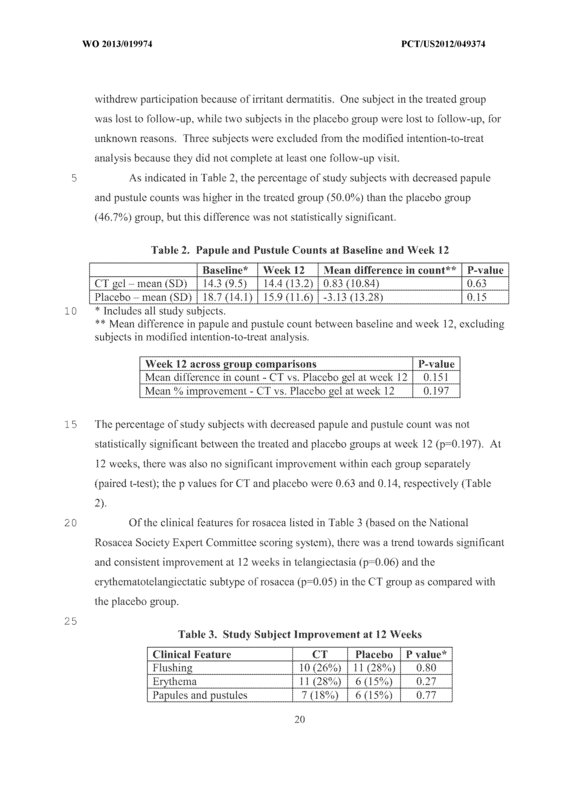 The use of claim 15, wherein the composition comprises about 0.02 to about 0.03 weight percent of retinoid and about 1.0 to about 1.5 weight percent of Imcosamide antibiotic. 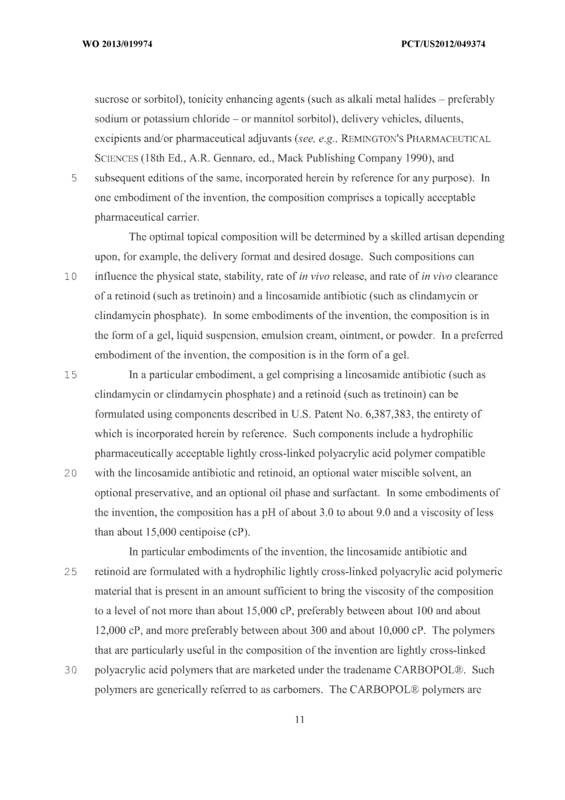 The use of claim 19, wherein the composition comprises about 0.025 weight percent tretinoin and about 1 ,2 weight percent clindamycin or clindamycin phosphate. 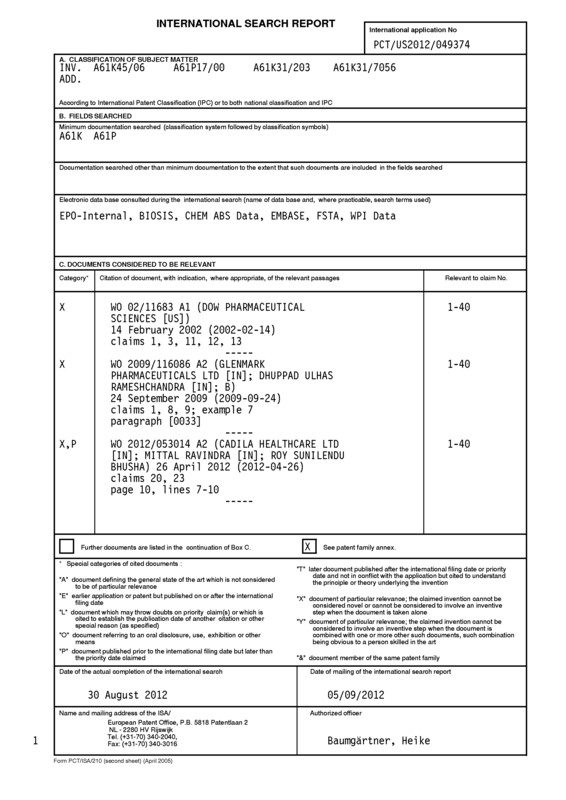 The use of claim 15, wherein the composition further comprises a topically acceptable pharmaceutical carrier. 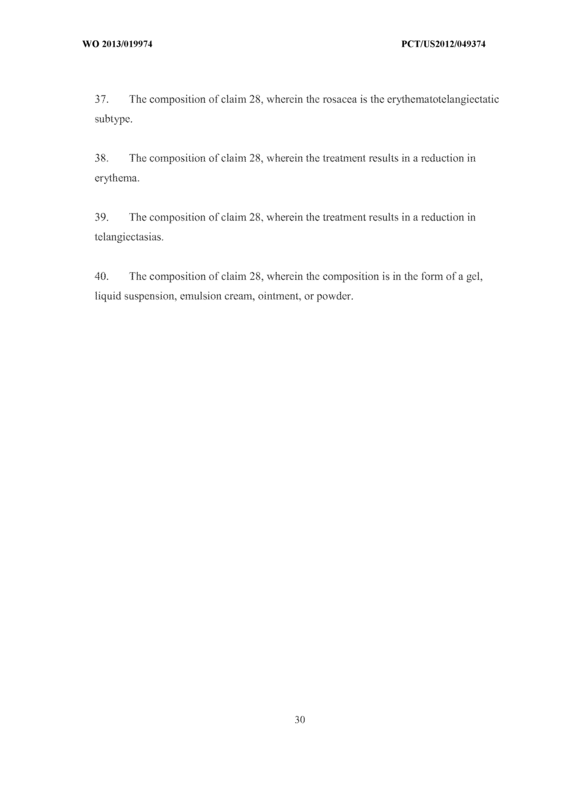 The use of claim 15, wherein the composition is topically applied to an area of the skin of the patient where the symptoms are manifested. 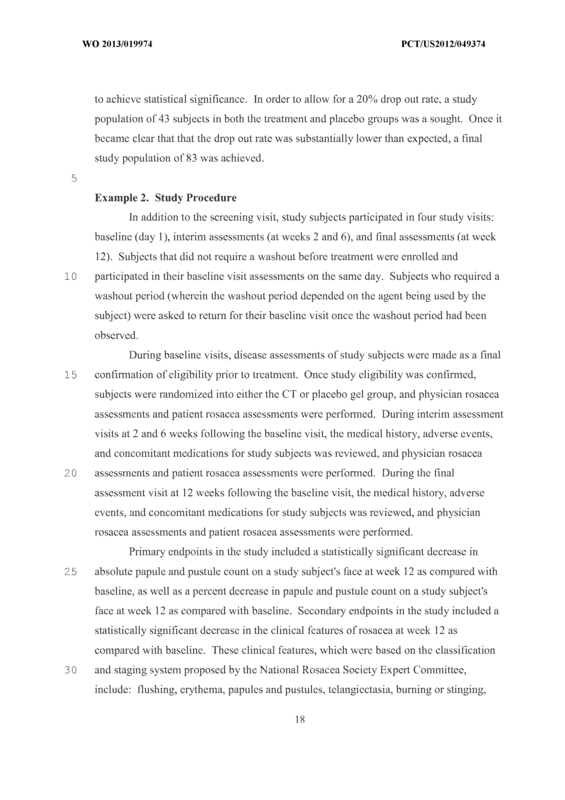 The use of claim 15, wherein the composition is topically applied at least once a day for at least twelve weeks. 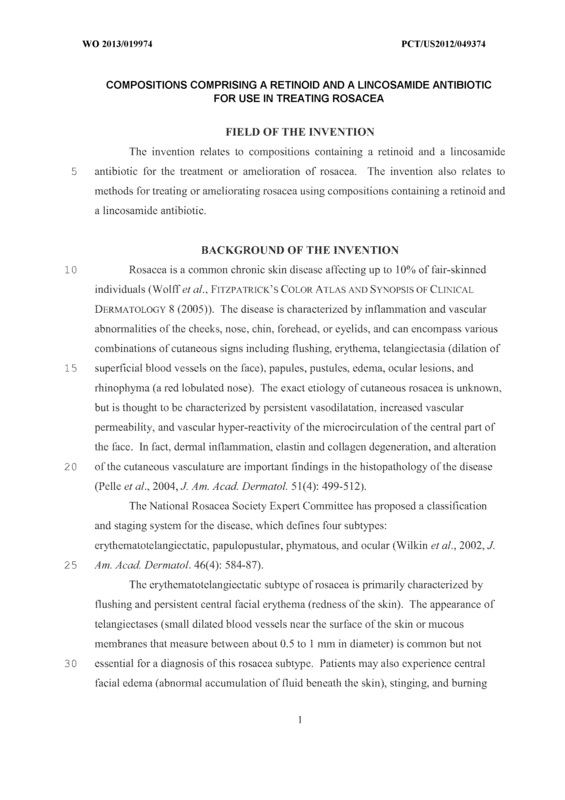 The use of claim 15, wherein the rosacea is the erythematotelangiectatic subtype. 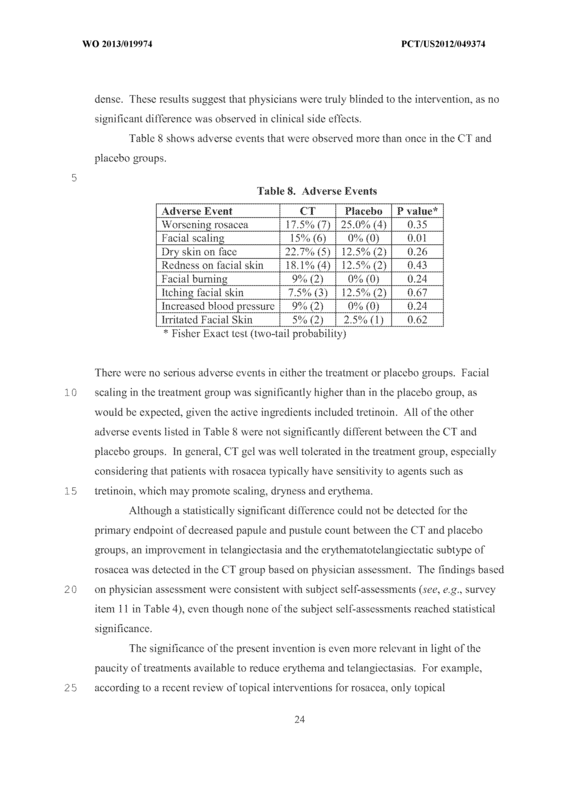 The use of claim 15, wherein the treatment results in a reduction in erythema. 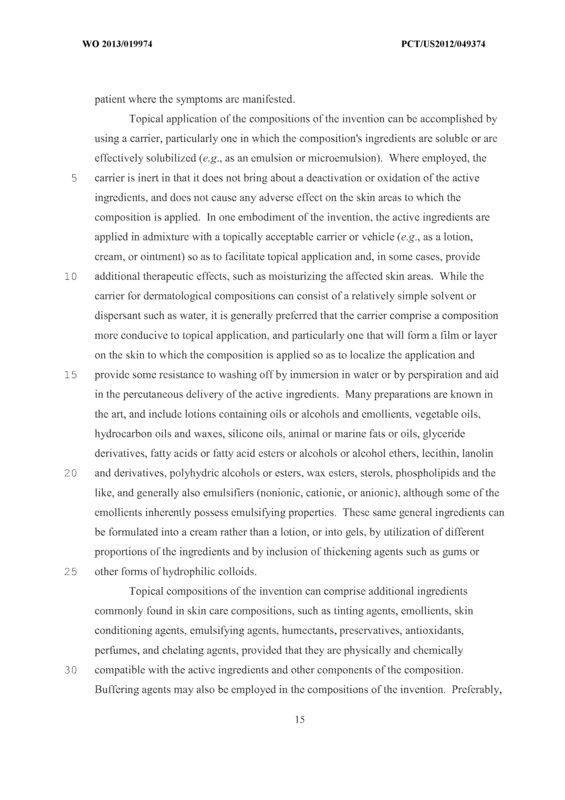 The use of claim 15, wherein the composition is in the form of a gel, liquid suspension, emulsion cream, ointment, or powder. 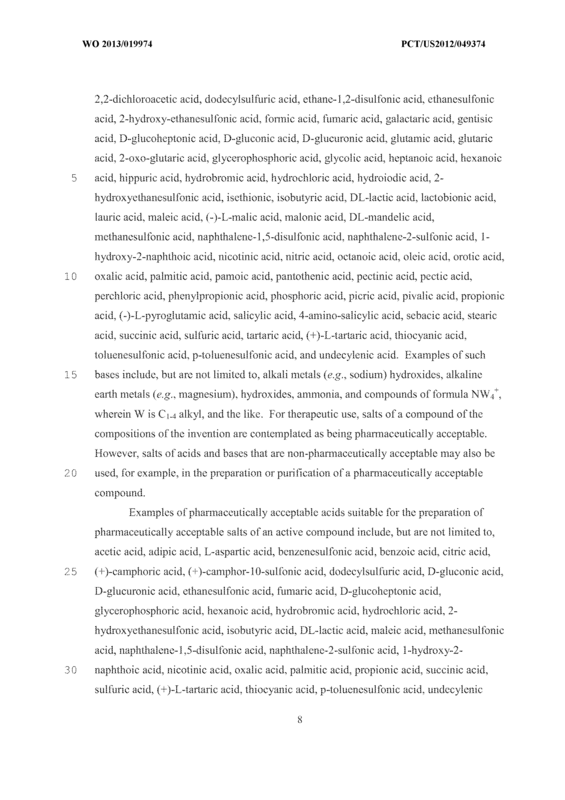 A composition comprising a retinoid and a lincosamide antibiotic for the treatment or amelioration of the symptoms of rosacea. 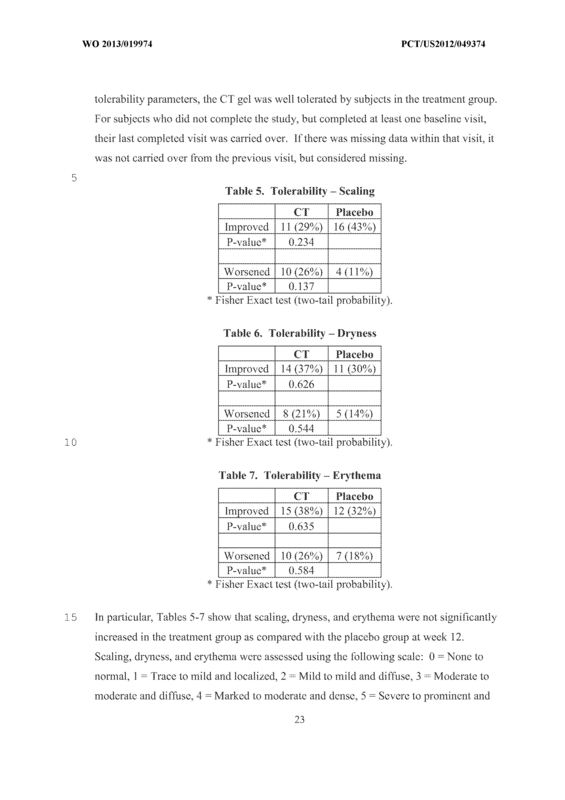 The composition of claim 28, wherein the lincosamide antibiotic is selected from the group consisting of clindamycin, clindamycin phosphate, and therapeutically acceptable salts thereof. 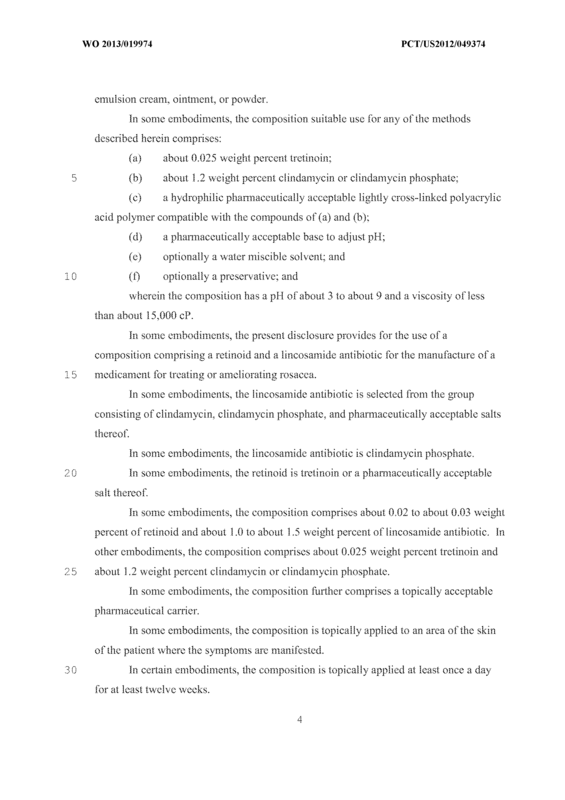 The composition of claim 29, wherein the lincosamide antibiotic is clindamycin phosphate. 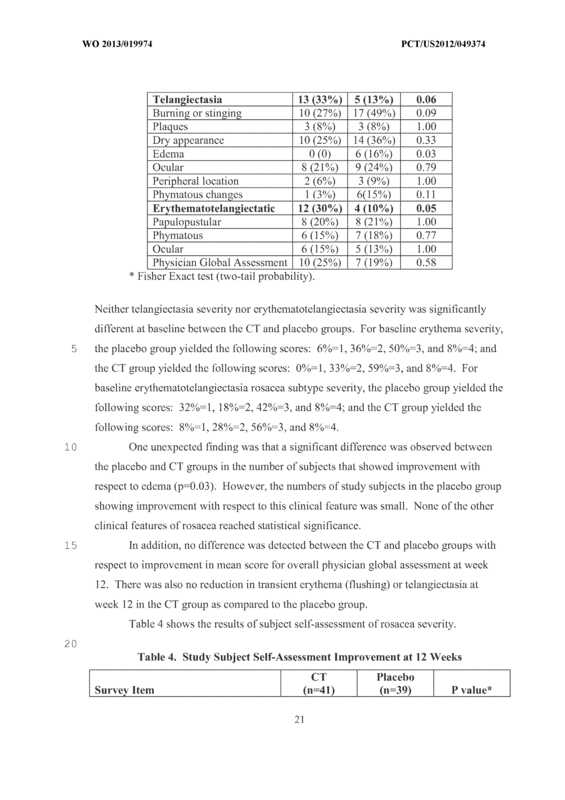 The composition of claim 28, wherein the composition comprises about 0.02 to about 0.03 weight percent of retinoid and about 1.0 to about 1.5 weight percent of lincosamide antibiotic. 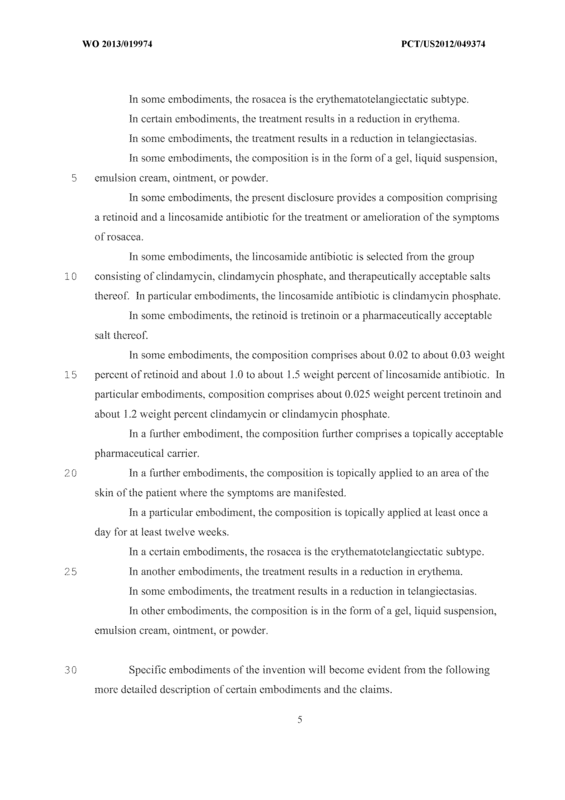 The composition of claim 32, wherein the composition comprises about 0.025 weight percent tretinoin and about 1.2 weight percent clindamycin or clindamycin phosphate. 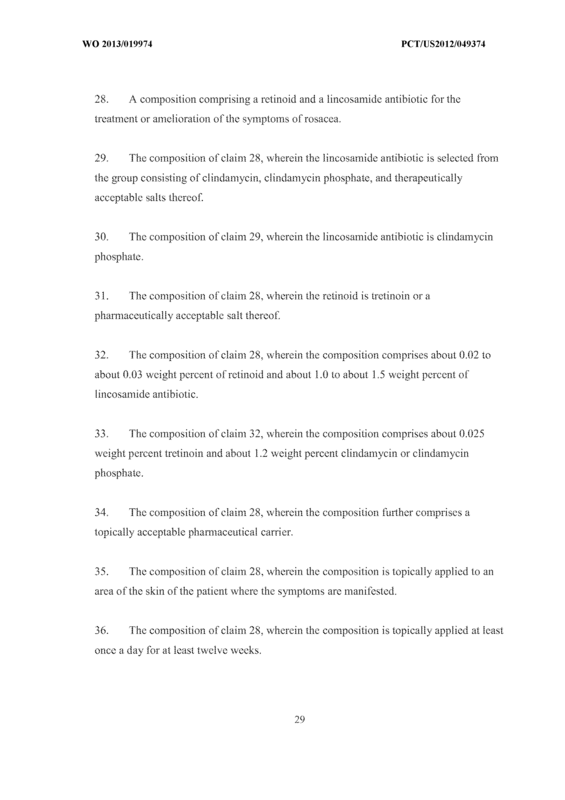 The composition of claim 28, wherein the composition further comprises a topically acceptable pharmaceutical carrier. 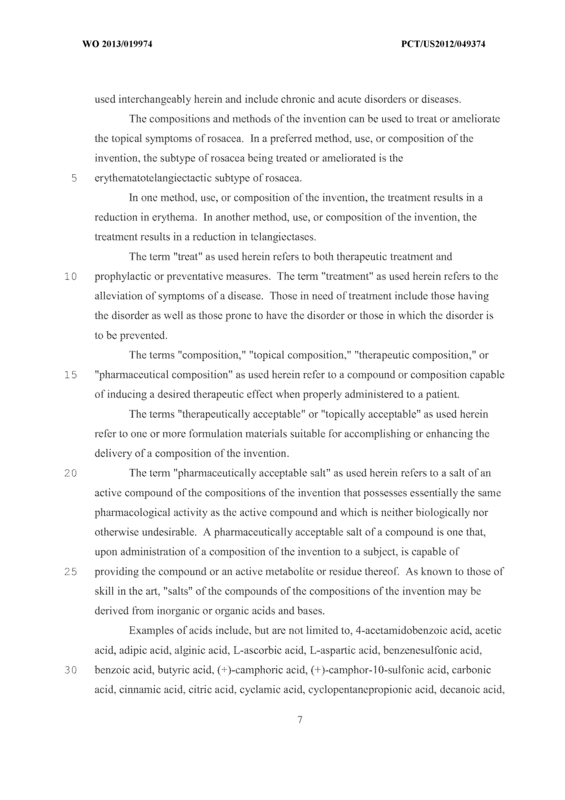 The composition of claim 28, wherein the composition is topically applied to an area of the skin of the patient where the symptoms are manifested. 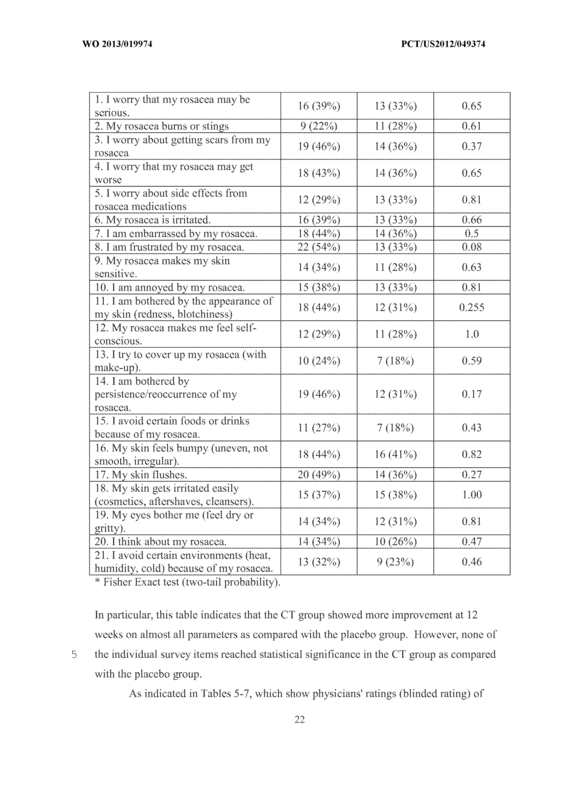 The composition of claim 28, wherem the composition is topically applied at least once a day for at least twelve weeks. 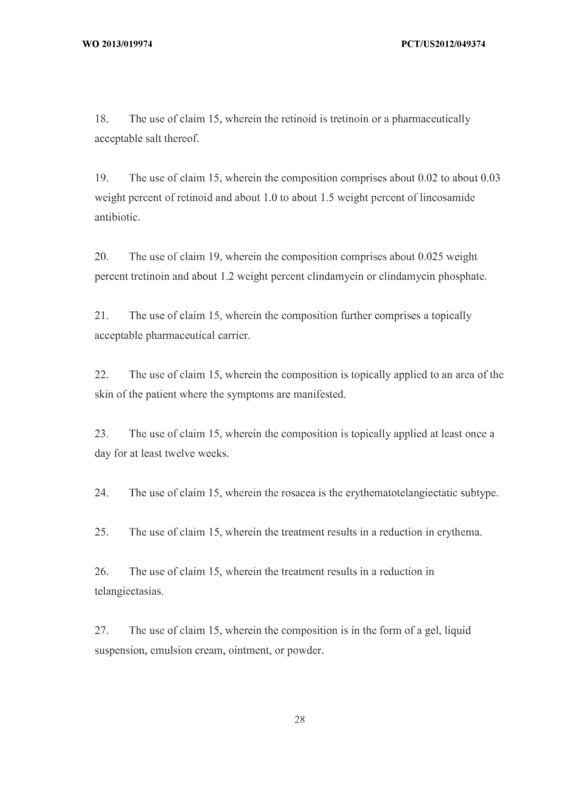 The composition of claim 28, wherem the rosacea is the erythematotelangiectatic subtype. 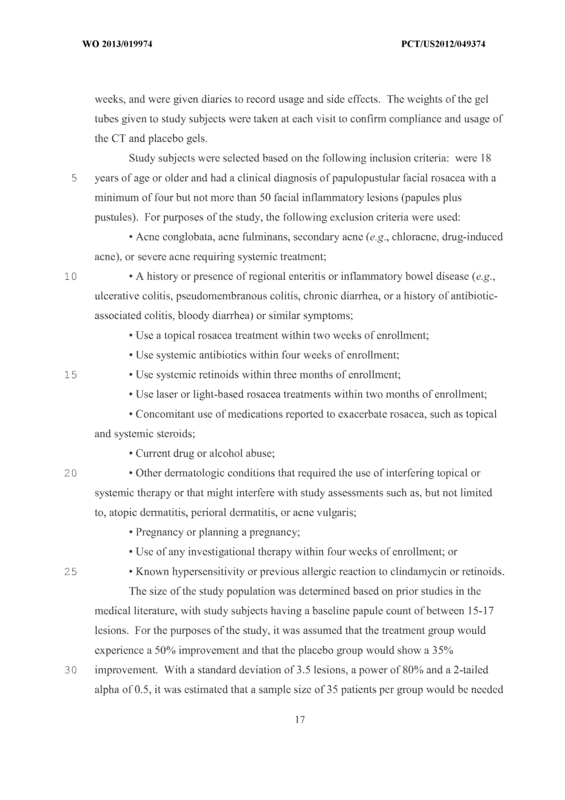 The composition of claim 28, wherein the treatment results in a reduction in erythema. 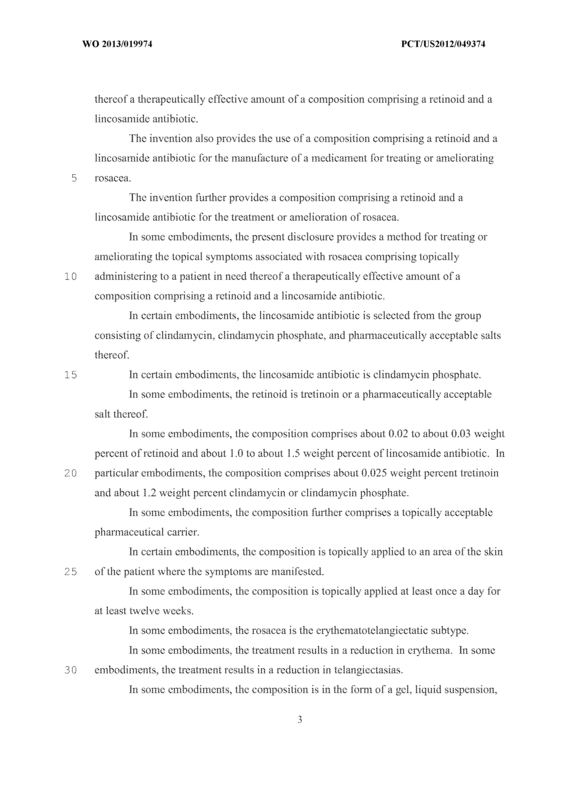 The composition of claim 28, wherein the treatment results in a reduction in telangiectasias. 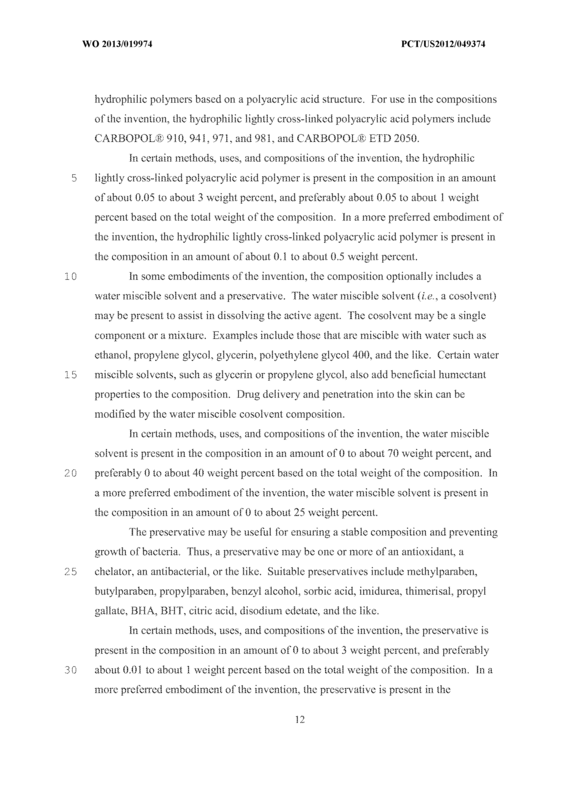 The composition of claim 28, wherem the composition is in the form of a gel, liquid suspension, emulsion cream, ointment, or powder.